Take the word “god” for example. Isn’t the definition of that word different among people? Who has the “right” definition? The word “success” is a human invention. Our society has bought into it. To be successful is the objective, the thing to attain; although it is not clear what it means. How wealthy is wealthy? How famous is fame? Isn’t respect nowadays another word for inspiring fear? Who is the authority to define what something is? The guy down the street wants “respect,” and he earns it through his ability to inspire fear into his neighbors. Being “generous, prosperous and kind” is not a corporate attitude or behavior towards business. We cannot make ourselves generous or kind through a corporate mission statement. We ARE or we ARE not. If we behave as if we were kind, generous, etc. from 8 Am to 5 PM, Monday through Friday… We ARE fake. Words meaning absolutely nothing. Pretty, touchy words, no feelings. All mind, no heart. That is the same scenario when most talk about love and loving someone. There is the blurb, the political correct phrases, the catchy words, but nothing else. Love is not something to talk about. Words destroy the sacredness of the moment, the relationship, what it could be… the feeling. Therefore, “Being successful,” means anything that you desire. Achieving that, means very little unless there is an agreement that it is worth something. For mice, to be “successful” could be to get cheese from a human refrigerator. But mice are “intelligent” enough not to worry about success. What is so important about a football game or a “world cup” soccer game? As our minds step away from words, the meaning of living Life in the innocence of an empty mind, will replace the meaning of the words. Every Life story from the “lowly” untouchable mosquito to the immortal Sam the true “man,” is neither a success nor a failure. In Life no one could be a success nor a failure but only in the “fantasy island” of the conditioned human mind, that is the mind full of duality. Remember: What someone says it is not accurately what they mean or feel. It cannot be. The “I,” the ego does not allow us to perceive the unity of all. That “I” solidifies separation through thinking. Thought means separation. Look at a sunset. What do you see? The Sun, the Ocean, clouds, the sky, seagulls, fish. All of those labels separate forms. In “reality” none of those labels exist, none of those separate things exist as separate; those things come as one, in one package, which cannot be contained as a static thing, for it is always changing as the weather changes. By labeling, naming and counting we become more interested in descriptions, analysis and dissections… the mind is in its glory! We become a mental entity devoid of a heart to feel. Naming, counting, describing and analysis will starve our being from feeling that landscape, that instant of Nature which will nurture us for we are part of it as well. The observer and the object being observed are related through feelings; they are one as long as there is no separation through thought. I am not saying that the mind is “bad.” It is just an out of control “device,” just like people nowadays behave with their smartphones; there is a continuous on-going dependency. With the mind is extremely subtle for we identify with it intimately, that is why we are not aware. When Ego exists; then to possess becomes the next thing in his agenda. Because the illusion of the ego will color everything else “I” perceive. That is why a religious path becomes an ego trip for many followers. That is why the “experience” of God becomes another way to solidify the importance of our ego. “MY” experience. I must be important, special… for others do not have it. It is true that all of those “experiences” with angels, Kundalini and chakras may happen is someone’s path, but they weren’t sought out, they came without looking to obtaining them; thus away from the egotistical mind. The ego is not interested in diluting itself into “no-I,” into an egoless existence. The ego must continue into the afterlife and must possess the “eternal, everlasting” things. By DOING all of those things, we are just going away, increasing the distance from realizing the self. It doesn’t work like that. There is a necessary assimilation/realization of Life experiences. Consciousness will move as the BEING is ready, not when the ego decides to “DO” it. Sit down. Relax. Unwind. Observe “your” thoughts. Are “you” willfully thinking those thoughts? The above could be called one of the greatest discoveries of self-realization. Anyone can do that. Anyone could take the time just to observe their “own” thoughts, but as long as we have a belief that there is a need for a “creator” for things to exist, we will not understand the above. We will say: “I am thinking. I am creating “my” thoughts” and then as I become more “spiritual,” I will be thinking that “I” need to change my thoughts. “Change your thoughts to change your life,” will be our motto. A thought is a reflection of emotions, for most individuals. A thought is a reflection of feelings for few individuals. In the consciousness of the “I” we have emotions. Anxiety, apathy, obsessiveness, attachment, fear… those are typical emotions which most individuals are not aware that these exist in themselves. Some will label these as: Being concerned, being detached, being focused, etc. It is in that re-labeling how we miss the opportunity to be AWARE of these emotions, which are coloring “our” thoughts. Ego is very emotive. An emotion will give someone a “high” and a “low.” Some label these as “positive” and “negative” emotions; however, observe that lost in that duality, we choose one (positive) over the other (negative,) when in fact; both are coming from the same place. An emotion is dualistic, just like the ego. An emotion will hold experiences in Life as “traumatic experiences,” if that experience was not enjoyed by the ego. That experience when is unable to be released, will be detrimental to the body /mind. The “fight against cancer” is in fact, healing emotions. We could destroy the “bad cells” but our “unhealed” emotions will make that experience to happen again. The “no-I,” the feeling is experienced when our thoughts are calm, when there is no anxiety or stress. That state is known as “meditation” for the masses. A healthy human being is someone who “thinks” very little, that is the “I” does not need to appear all the time. The “little voice” talking to us, is not present as much. It is in that state when we are able to OBSERVE and feel. Do we see the relationship? More thoughts, greater ego, more emotions, less observation. If what you think or believe does not agree with what you feel, that means that your emotions are creating the reality of your thoughts. 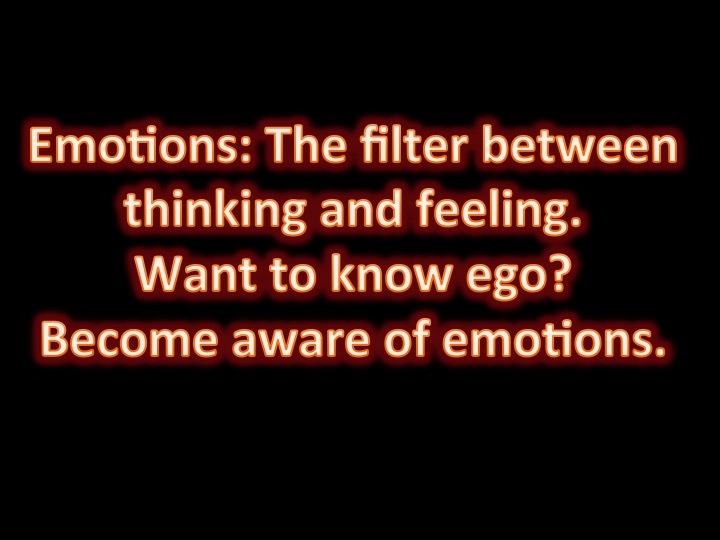 Those emotions are the manifestation of your ego. When we are able to feel without the “filtering” of emotions, there is no need to think, in other words; “my” thoughts will be the same as “my” feelings. When we operate in that way, we operate with honesty in Life. Some may call that Harmony or Balance. Love is not an emotion. “Love” as an emotion will be dualistic: Euphoria and depression will be experienced. Hate, attachment, dependency, neediness will be experienced. When we enjoy Life, then we could know Love… but before Love, there is Peace. When we find Peace, we find Love… and when we find love… we find Joy. “You are love,” they say. Why some religions and philosophies spend so much of their beliefs in “conquering the mind” or “controlling the mind” if “I am not the mind”? That is perhaps one of the most important realizations to go beyond the “head” and into the feeling of living Life. Every word has an opposite. That is how duality is created in our communication. Now, that we could see this handicap inherent in the way we “think” (for words are needed to express thoughts) then we could see how plain stupid is the idea of “defining” God, “defining” who I am, “defining” Life, etc. Do we see that we are using words to express in duality that which is not possible to express through duality? Do we see how thinking alone cannot bring a different state of consciousness, other than the perception of separation? Living life in joy is not concerned in the most minimum in defining or conceptualizing Life. Do not define yourself to be able to change, to flow, to live. The unity of the body, mind, spirit, soul is artificially divided through thought; when in “reality” it is unity which no label or definition could touch. Moreover; the unity of body, mind, spirit, soul is ONE with everything else, for it cannot exist all by itself. Totality. Thinking and its entire family of beliefs, judgments, assumptions, analysis, logic and reasoning are not the “tools” to live Life in Joy. Life’s pleasures are part of the whole experience of living. Separating pleasure from pain, we have created a duality. Choosing one over the other, we have created an illusion. There is no separation between pleasure and pain for the experience of one, necessarily leads to the experience of the other. Want to feel guilty? Want to ask God for forgiveness? Make that separation. That is all it takes. That range is like a colorful rainbow in a rainy afternoon. Anyone with eyesight could see a rainbow. 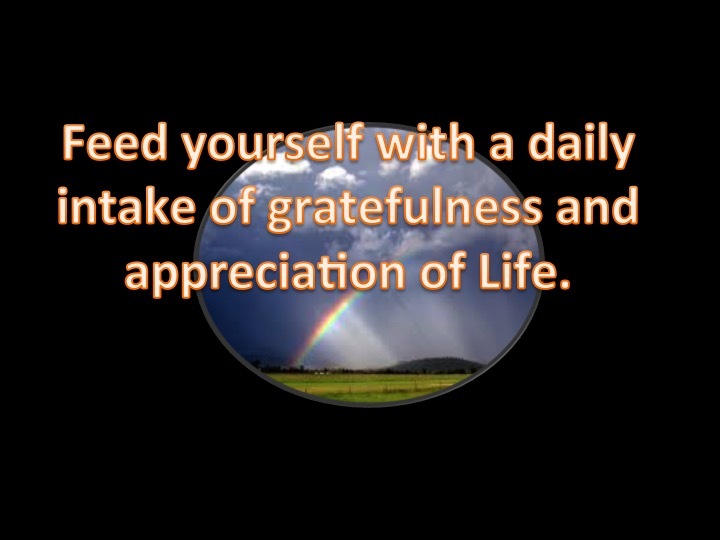 That person could enjoy by appreciating the sight and perhaps adding gratefulness for such an experience! That is to enjoy life. It is so simple, so thoughtless, so uncomplicated. The simplicity of enjoyment could be taken away once thought enters through our analytical mind. All issues start with a seemingly innocent question. What is the color of the rainbow? That is the beginning of trouble. -”Indigo?” What on Earth is that? Don’t you see it is violet or purple… Same thing different label. Pure enjoyment changes into “who is right” and thus, the label of being “wrong” also appears. Who is able to see the rainbow as white color? Isn’t that arid definition a boring, tasteless and deceiving “reality”? Therefore, what is the color of the rainbow? For someone caught up with the mind and thinking, to “know” the facts even though it is just information biased by perceptions, that is all that matters. That information is totally useless when it is looked at from the standpoint of appreciation of Life and the intimate relationship that this experience could have in our lives. The experience of seeing a rainbow. Wow! Feel that fullness gathered through seeing with an empty mind. That is meaningful. Life has a meaning in that way. That “seeing” without mind is pristine, new. It does not have comparison built in nor judgment. That is the sin. Comparison does not know about appreciation. Judgment does not know about gratefulness, therefore… that state of mind does not know about enjoyment. Can we live life without enjoyment? It does not matter what your religious beliefs are. It does not matter what your moral values are. It does not matter what pious actions you may do. It does not matter what type of Divine experience is following you…. If there is no enjoyment in Life “now” under whatever is happening, what in the heck are we living life for? Paradise tomorrow? A nice job in the future? The kiss of a princess? Are we holding our breath until then? It was in that thoughtless observation how Life presented a new exquisite flavorful meaning, which escaped all wordy, brainy definitions given by Wikipedia. 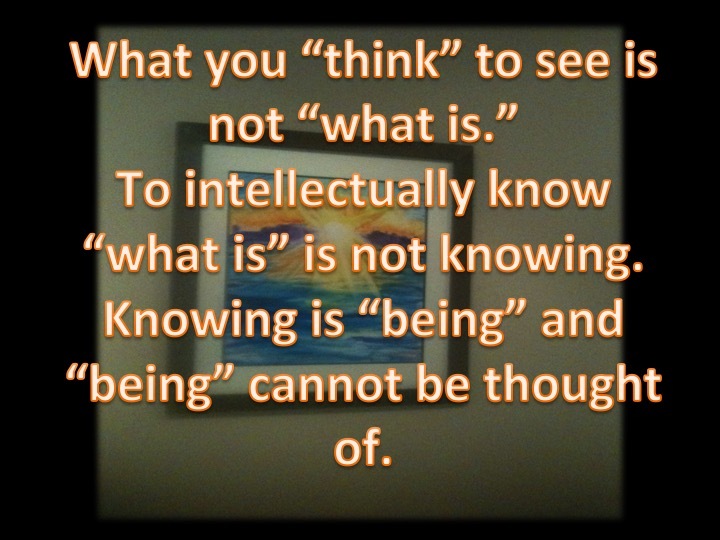 In the beginners track of “Spirituality 101,” thinking and thoughts are emphasized. Wow! That sounds great. Terrific! If you have a thought, just be aware of it and change it into something positive. Believe in that positive thought and make it a reality! Such “pep talk” is easy to sell… Here is my latest book for only $9.99 plus taxes. The latest techniques in “positive thinking” thought by the greatest “spiritual geniuses of the world” are compiled just for you! You will experience a change in your life! Guaranteed! Are “my” thoughts, truly “mine”? That is the first question to ask. Second question: If those thoughts are “mine,” why I cannot stop them? Thoughts are mostly a reflection of who we are. What it needs to change then is “me” not the thought. “When I change, the thought changes…” 🙂 Shall I put a “trademark” note on that phrase? Ralph, an aware individual; discovered something interesting about himself. He wasn’t being honest with his feelings. Choosing another thought to entertain himself will not change the way he feels. Thoughts are like clouds on the sky of the mind. A thought will appear according to who we are at that time. We will identify with that thought, make a story and… Voila! A “new movie “ has appeared waiting to be played in the movie theater of our minds, several times during the day. Thoughts come and go. If we reject a “bad” thought; it will come back with greater strength. Be aware of the thought. Let it go like a cloud moving in the sky. How we feel is the “real thing” and as we become open to the experiences that life brings through healing our emotions, we will experience that a cloud is not the vast sky, unless we believe that. Honesty has a greater meaning when it is about the self. In that answer, there are 3 different types of consciousness. Thus the “right teaching” will be according to that state of consciousness.